What is it like to work for BookaTrack? Both competitive and non-competitive motorsport can often be seen as restricted, close nit communities, but there are multiple opportunities available in each field. This is the case with BookaTrack. Although many of BookaTracks staff members come from competitive motorsport backgrounds, an interest in the competitive side of the sport is not essential in this line of work. Falling under the category of non-competitive motorsport, track days are an ideal outlet for general motoring enthusiasts. Obviously a job role in this field is far from your average 9-5 desk job, but hard work is very often rewarded. Together with the chance to travel around the UK, there are a number of opportunities to travel abroad whilst working with BaT. Trips include visits to the highly infamous Spa Francorchamps circuit in Belgium, whilst other excursions have included visits to racing circuits in Germany, Portugal and Spain. The welcome bonus of being able to enjoy some nice weather along the way also makes up for those cold, wet days were used to here in Blighty. More hard work and long hours surround the away trips, but the work hard play hard ethos runs high within the BaT ranks. At the end of a long day its nice to relax and socialise with the rest of the team and customers, and with a variety of ages amongst our dedicated team of staff, and customers, there is always a welcoming atmosphere. A typical weekends work at Spa consists of one day travelling to Belgium, two days at the circuit and one day to travel home. After a quick breakfast at the hotel we head to the circuit to set up for the day ahead. Everyone wants to sample the Spa circuit so you are guaranteed to be kept busy all day, whatever your role. At the end of a tough day everyone retreats back to the hotel to discuss the action from a day at the track, enjoy some banter, and prepare themselves to do it all again the next day. 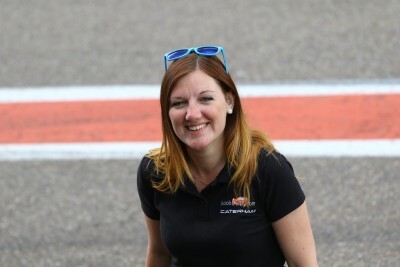 My role with BaT developed from contacts in my other job as a motorsport journalist and PR representative. After being offered the chance to work with the team I was given more regular track day work in the role of Pit Support. The purpose of this role is to check wristbands and car stickers for drivers and passengers going out on track. Given that the biggest part of my job is weekend work at race meetings, I have been available to work for BaT during the week, which means my two jobs link in well with one another, and the added bonus of having an interest in competitive and non-competitive motorsport makes the connection between my roles that much stronger. From my first BaT encounter it was clear working for BookaTrack would be a fantastic experience - an experience which extinguishes the idea that opportunities in this line of work are limited. Another glamorous day in motorsport with the coldest day ever at Spa (the heaters are under the table! The only place to go for all the gossip on a track day - the sign-on desk. Playing (and working) hard on the last night of the Iberia trip 2012. Our team of mechanics getting one of our Caterhams ready for a track day.